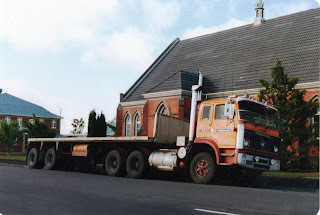 International F4870 Eagle of Freightways with spaced axle semi parked in Worksop Road Masterton outside St Luke's church. 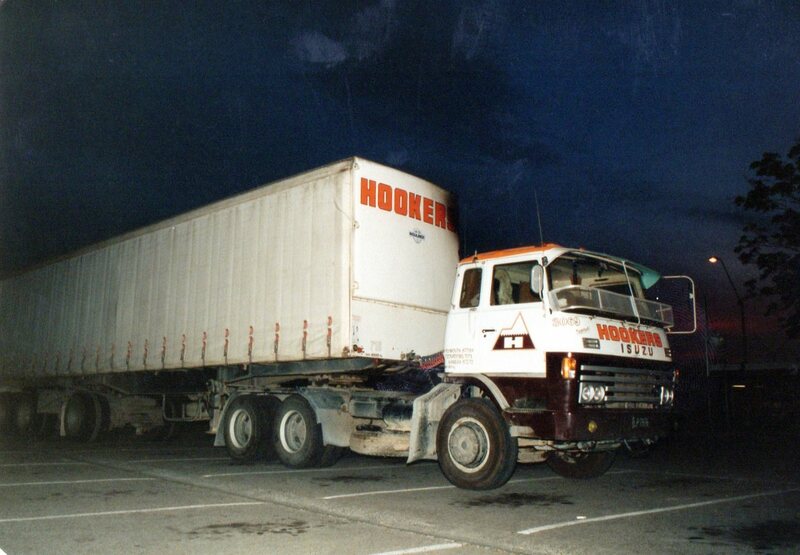 Isuzu of Hookers with self steering semi-trailer lit up by flash. 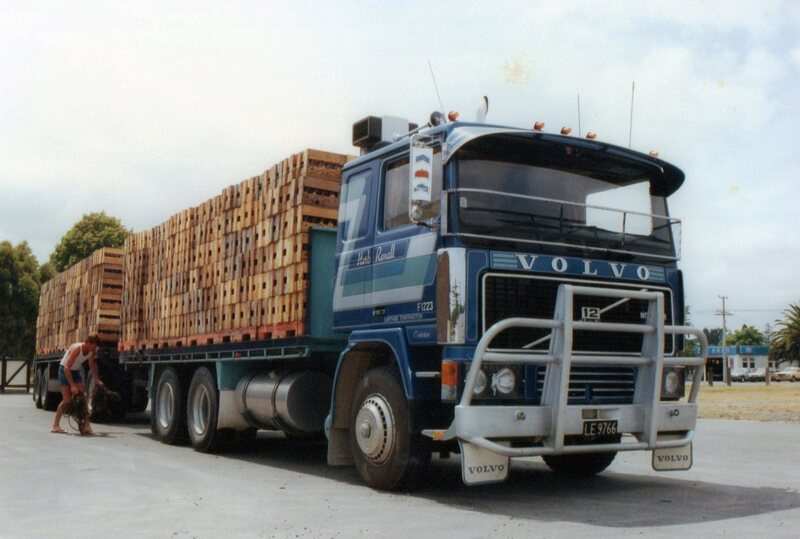 Herb Renall's Volvo was one of the first intercooled F12s in NZ. I'm not sure if this load is crates of full beer bottles or empties on their way back to the Mangatainoka brewery. 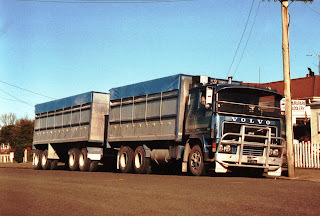 Herb's Volvo a year or two later now fitted with tipping bins. 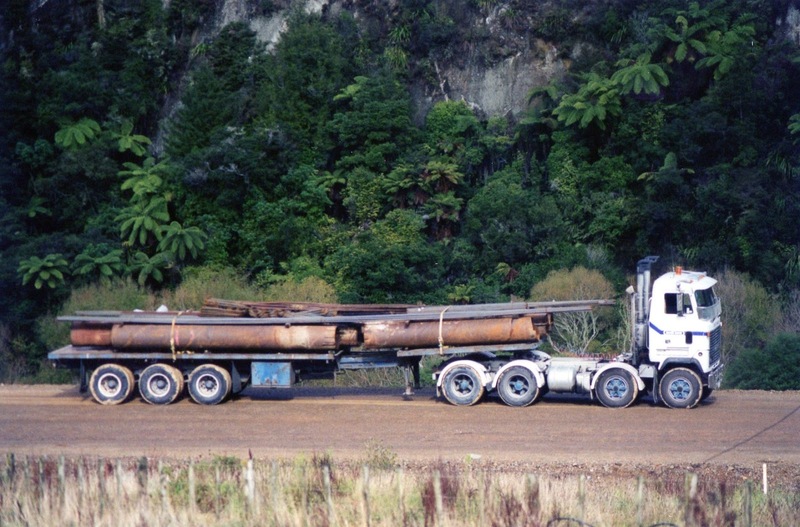 Mack Ultra-liner with trombone trailer at the site of a new bridge at the southern end of the Awakino Gorge. This Western Star finds its way through the detour. TCD (Temperature Cooled Distribution) has now vanished. 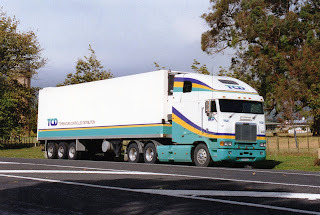 This '98 Freightliner FLB was parked near a cafe in Cambridge. 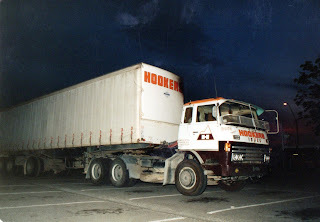 A Daily Freight (part of the Mainfreight group) Mack with 20ft container. 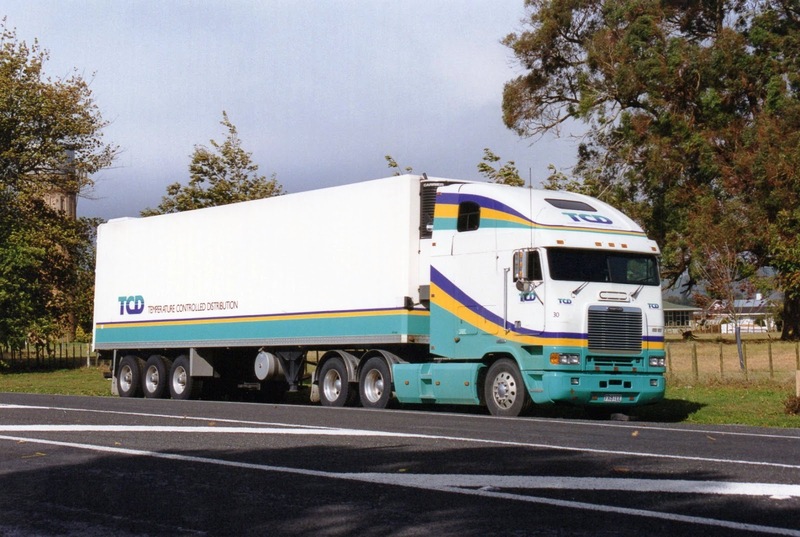 6 wheeler Hino is just a load of rubbish. 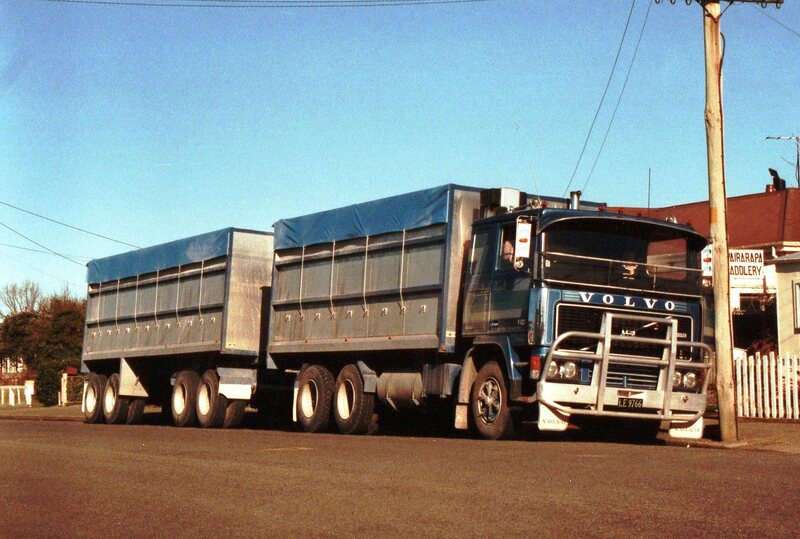 A total of 5 axles on this Scania curtainside combination, suggests it carries light-weight products. Normally I would crop the power pole out of Max's pictures, but as he proclaims, it's a trifecta. 19 axles of Isuzu, Mitsubishi and International. 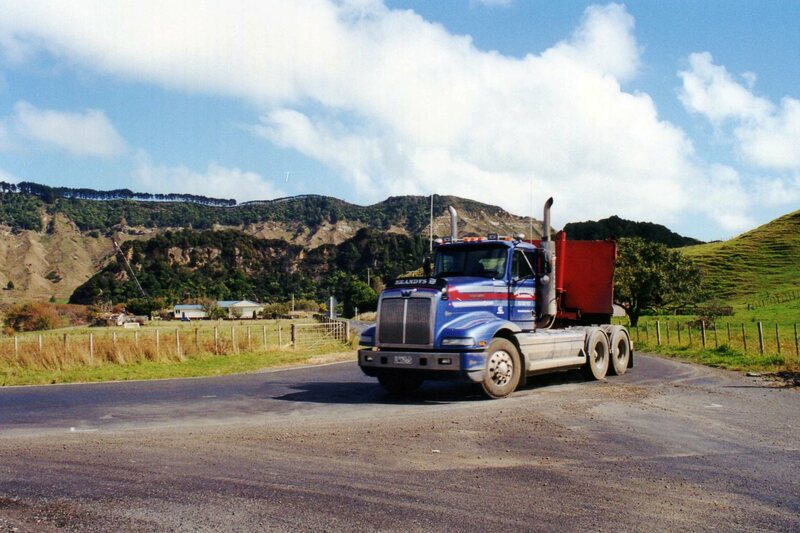 Hinos are popular in NZ. 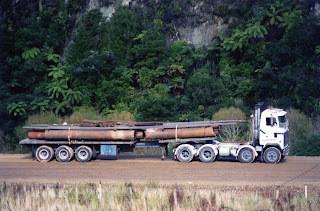 This 7 axle rig is working for Higgin's who do earthworks and asphalting. FL Volvo and trailer of Rural Fuel passes a non-interested lamb. More from Max and Me. 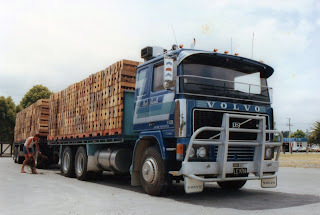 Let's Look at Some More Trucks. I've Found Some More !